In The Wednesday AM With Valerie & Tyler! Again, we had another lovely start to our day with an early AM visit (and by this I mean before Noon) by Friends of Otis & James, Valerie & Tyler! They thought that they would come down here and take some tough rockin’-gut bustin’-shoe-shinin’ (uh…yeah, that last one is a reach) fanatascrackticular (which is a word – look it up beezos) Engagement Photographs! Listen, my children…if you put your ears right next to your computers, you can hear the sweet hum of perfection…coming from these photographs. But it is not us that causes this humming, nor is it the electronics that are inside of your computers. 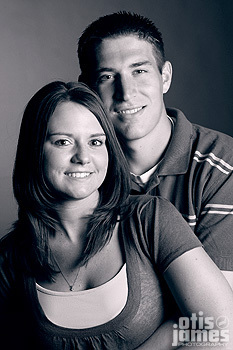 Oh no, this perfection comes from none other than Valerie & Tyler – as they made the session awesome! And even though I was doing my best (is it alright to start a sentence with and?) to blind them with my reflectors of pain, they kept the awesomeosity flowing from their heads…does that sound good?? Kind of sounds like they may have been injured. Perhaps flowing isn’t the best word, and perhaps from their head isn’t the best spot to be flowing from. But I digress. What I meant to say was that they kept their awesomeaciousness level at full blast, or something like that. Look, they rocked – there – simple as that!! I will leave you now with some sample snaps, and with a thank you to Valerie & Tyler for stopping by to see us – Enjoy! Previous Previous post: Jon & Brenda! Next Next post: Cameron & Ashley…Rock Stars of the Highest Order!